Relative to the Freedom Climb organized by Philippine National Mountaineering Society (PNMS), LOGSAC will be initiating its tribute climb to freedom fighters on June 11-14, 2009 at Mt. Apo via Sibulan Trail Sta. Cruz, Davao del Sur. It will be a joint effort with the Sta. Cruz Tourism Council (Eco-tourism Committee) and Telecommunications Eco-Adventure Klub (TEAK). This 4-day affair shall commenced with a basecamp activity at Camp Sabros then a flag raising ceremony at the Mt. Apo summit in the morning of June 14. Since this is an open activity, we welcome guests to join us on the above-specified dates. There will be a registration fee of 1,900. The amount shall cover back and forth transportation, certificate, I.D., 1 night hotel accommodation and souvenir t-shirt. 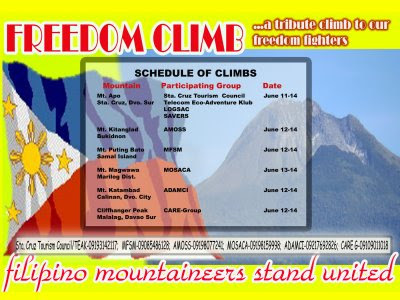 There are also other Freedom Climbs featuring other mountains in Mindanao with other mountaineering clubs as the lead organizers. (Please refer to schedule of climbs in the above poster attached).